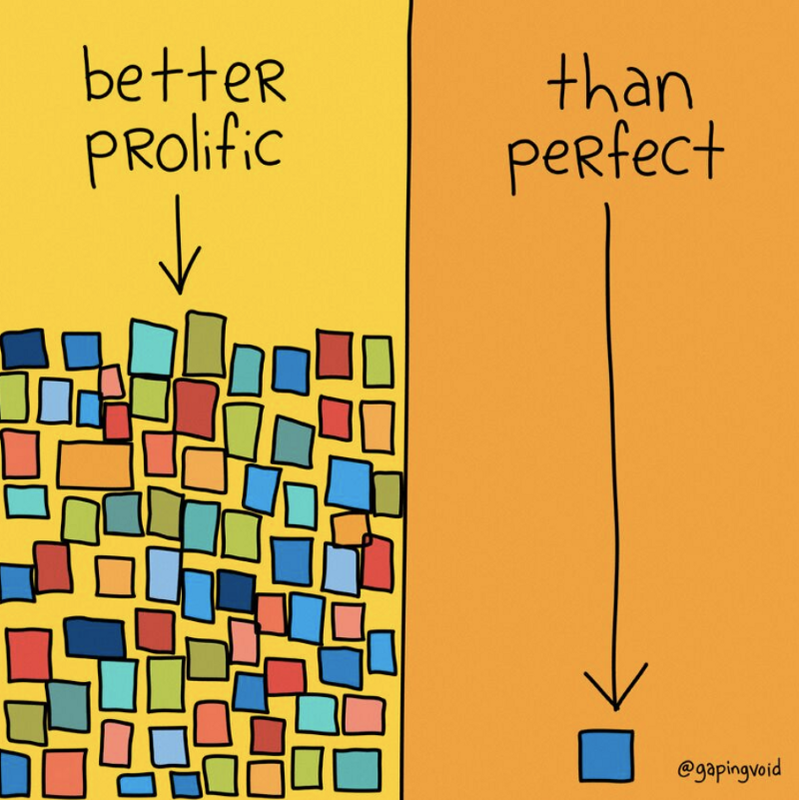 The above image is my “Culture Wall,” created by GapingVoid, a company that helps people design their organizational culture. 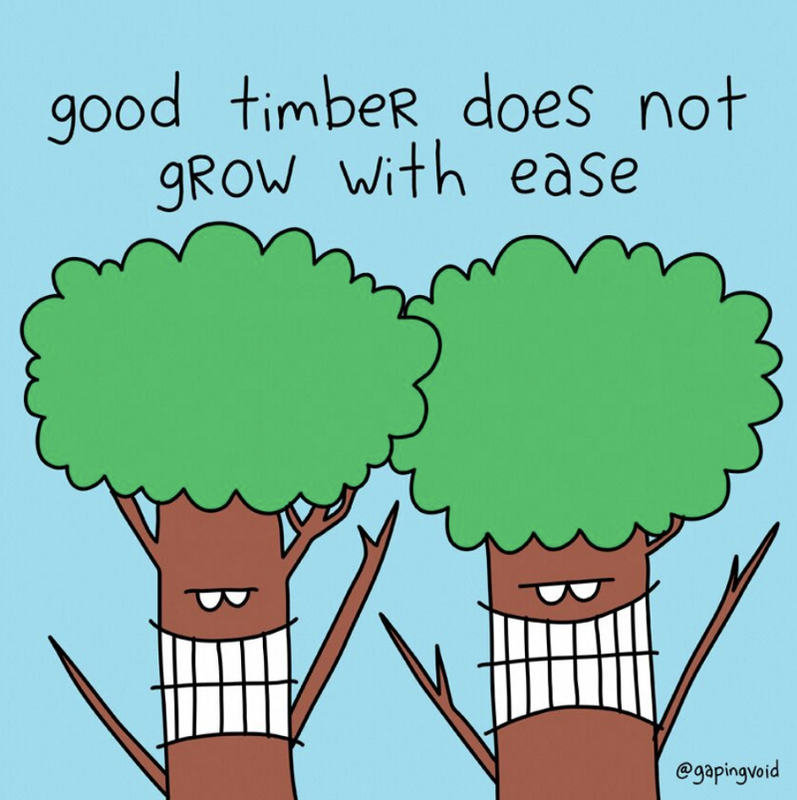 The art is done by Hugh MacLeod, who has drawn pictures for books by Seth Godin and many other influential individuals and companies. This Culture Wall is intended to create an environment that continually reminds me of what I stand for and what I aspire toward. This Culture Wall surrounds me as I work. 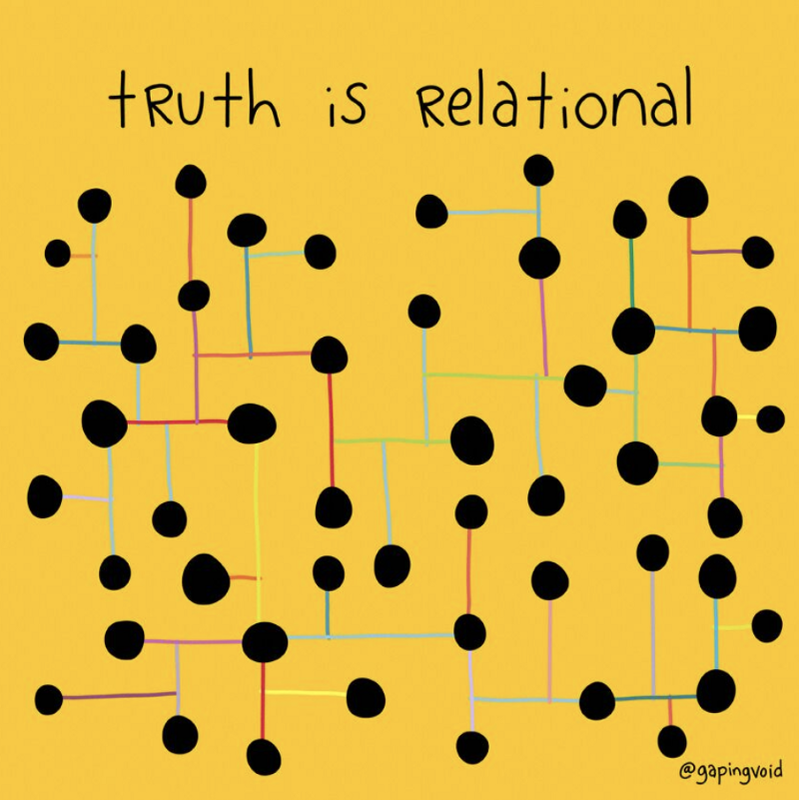 According to Jason Korman, the CEO of GapingVoid, art can be used as “cultural artifacts” that act as triggers. But even more, they create a shared vision, set of beliefs, expectations, and direction for desired behavior. I call these artifacts TRANSFORMATIONAL TRIGGERS. The reason they are transformational is because they are deeply EMOTIONAL, to me. The only way for a trigger to be transformational is for it to be tied deeply to a set of emotions, memories, and goals. How are you designing your life? How do you create success in your life? What ideas allow you to live and create at the level you want to? What drives you, every single day, to produce something that you can look back on and remember? Every single day matters. You can either spend those 24 hours or you can use them to create something that brings your life forward. Money fades with time. But the things you create have the power to endure. For example, great works of art continue to impact and influence long after the creator of those works has passed on. If you spend each day moving forward toward your dreams, you’ll be shocked how far you go. We have more than enough time to do an enormous amount of good in our lives, if we use the time we have. If you’re committed to living your life to the highest possible level, the following 20 images will inspire within you a deeper commitment. Commitment is necessary, every single day, to grow and succeed. Moreover, commitment is something you must consciously engineer into your life. Commitment isn’t just internal, it is a blend of both internal and external. Commitment often comes by making a public statement of what you’re going to do. It comes by seeking help and admitting weakness. It comes from having accountability. It also comes from simply behaving in the right way. Motivation and momentum are two highly connected concepts. You cannot have either of these without first acting in a goal-directed way. You can’t wait until you feel inspired to act. Motivation doesn’t just happen, instead, it is a reaction to intention and integrity. When you begin taking small steps in the right direction, motivation and momentum immediately kick-in. You need to think in advance and plan ahead, even just slightly. This may mean that you need to take 5-30 minutes in your evening to prepare yourself for the next morning. Motivation, then, is about set-up and follow-through. When you tell yourself you’re going to wake-up at 6 AM and then EAT THE FROG (which is to do your #1 most important task first), and then you actually do it … then you begin to EXPERIENCE motivation. Motivation then quickly becomes momentum because as you do the right thing, it becomes increasingly easy to continue doing the right thing. Getting creative insights regularly is something you can personally master. Psychologists call this “epiphany ability.” Like motivation, inspiration is not something you should wait for. Instead, it is something you need to design for and actively seek it! The ideas flowing into your mind are heavily influenced by what you personally desire in your life. Your decisions — both the daily ones but also the BIG ONES — shape your desires. Your desires are the product of your behavior, not the other way around. Therefore, you can train your desires. You can train yourself to want success, happiness, health, and deep connections. You can train yourself to want to work hard. You can train yourself to want anything. You do this through specific inputs and actions. As you consistently act in powerful ways, your confidence grows which triggers newer and higher-level desires, which evoke new ideas and inspiration. Eventually, you’ll want incredible things that no one else has thought of before. You’ll become a visionary with desires to serve humanity in bigger and more innovative ways. You’ll become an idea machine. You’re 60 days away from more inspiration than you know what to do with. All you need to do is begin acting in far more powerful ways than you’ve been acting. Pay attention to what your mind tells you. Write it down. Then keep acting in an upward cycle. Dan Sullivan, founder of Strategic Coach, explains that CONFIDENCE is the thing that entrepreneurs need to protect more than anything else. When you lose your confidence, you lose everything. How much fire do you currently have to pursue something powerful? How much fire are you lighting in others? Like motivation and momentum, confidence is something you must create every single day. Confidence must be designed for. You must be highly proactive and intentional about it. In other words, past confidence will only take you so far. If you rely too heavily on prior experience and stop pushing new boundaries, you’ll get stuck. Eventually, everything will start crashing down. Because to maintain confidence, you must continually be growing. You scare confidence away by trying to maintain the status-quo. Confidence, by nature, requires that you take bold new risks to seek new growth and opportunity. A 2014 study done at the University of Illinois at Urbana-Champaign by Dr. Nathan Hudson and Dr. Brent Roberts shows that over 97% of people want to change significant portions of their personality. Sadly, despite wanting to make permanent positive changes, most people have been taught that personality is a permanent fixture of who they are. Your personality is not who you are. Your personality is how you show up in certain situations and relationships. According to Dr. Gabor Maté, personality is an environmental adaptation. In many ways, personality is the product of previous trauma. Once that suppressed trauma is healed, the personality will change. For most people, personality is reactive and unconscious. However, personality can be proactively designed for. You can transform who you are and how you live. But in order to do so, you’ll need to change how you act. You’ll need to begin living, right now, as you desire to become. You have great power within you to BECOME. In order to do so, you must be intentional. Who do you want to be? Having a powerful morning routine is important for all of the reasons listed above. If you do not start right, you will have a hard time reversing negative momentum. If you do not start right, you signal to yourself that you’re completely fine with the status-quo. If you do not start right, you decrease your motivation and confidence throughout the day, which leads to increasingly impulsive and negative decision-making. It’s a vicious cycle. You make or break your life with how you start your day. However, beyond simply starting right, you need to design correctly. The ordering of how you engage your morning routine matters. You need to put first things first. You need to know your triggers. What are those things that will completely throw you off? How can you control for those? If you design your day correctly, you can get more done by noon than most people get done in a full week. But the order of operations matters. Don’t try to multitask and don’t try to do too many things. Deep work is far more important than shallow. Staying focused on one thing for a long period of time will create more long-term results than doing lots of little things that may give you short-term dopamine and seduce you into thinking you’re actually doing something powerful. Anything less than 100% doesn’t work for most people. 100% commitment is what creates resolve. Once you’re fully resolved about what you’re going to do, you then go about creating environments and circumstances that make that commitment real. Trying to be 98% committed to something doesn’t work because it leaves everything up to chance. For example, if you’re trying to eat healthily, but haven’t fully decided BEFOREHAND what you’re going to do, then you’re always living reactively to the situation at hand. 98% commitment is a slippery-slope. When you’re not completely certain what you’re going to do in a given situation, you must then rely on willpower. And of course, with enough experience, you quickly come to realize that willpower doesn’t work so well. Decision is far more powerful. There’s a reason most people live far beneath what they could. They never make truly committed decisions and then stick to those decisions. If you really really want to change your life, you must make that decision. It must be firm and resolute. It’s okay if you fail along the way. But in order for it to be a true decision, you must be willing to see it through to the end. In order to see it through, you must live in accordance every single day. You should start and end your day by writing down and visualizing the completion of your decision. When you write down your dreams in vivid detail, you begin to engage both your conscious and subconscious minds. Drawing out your dreams in the form of a mind-map is also very powerful for engaging both sides of your brain. Writing down your dreams and deeply visualizing them will make them more emotional for you. Until your dreams become emotional, they won’t be powerful enough. You need to reconstruct your identity and memory through developing a new and emotionally-driven vision of your future. As you write your dreams down every single day, write down the ways in which you will actually achieve those dreams. Focus more on WHO than HOW. When you focus on WHO, you allow yourself to think much bigger. WHO can help you achieve this? WHO do you need to learn from and be mentored by? WHO has the networks and connections and capabilities to help you achieve this? WHO can take everything else off your plate so you can focus on what you do best? WHO-thinking immediately takes your vision to a much higher level. As you write down your dreams and goals, the right people will start popping into your mind. A key part of your success will be learning how to position yourself such that you can connect and collaborate with the right WHO’s. All of this stuff can and should happen in your journal long before it occurs in reality. You then act and continue acting in powerful ways and watch as your journal entries become more vivid and clear. Watch as your goals become realities quicker and quicker and quicker. Everything you want is available to you. You just need to make the decision about what you want and how big you’ll play. Expressing gratitude changes you. It changes how you see things. But it also changes whoever or whatever you’re grateful for. There is potentially nothing in the world more powerful than gratitude. It is considered “the mother of all virtues.” The benefits of gratitude are endless. But more than anything, gratitude helps you realize the abundance of all around you. What you focus on expands. When you focus on the abundance, you invite an endless stream of it into your life. If you’re serious about making huge advancements in your life, income, and situation, you’re going to have to make some bold bets. You’re going to have to put your chips on the table. Here’s my favorite narrative from my Master’s Thesis, where I interviewed several entrepreneurs and wannabe entrepreneurs. The main difference?Entrepreneurs have had some form of “Point of No Return” experience, whereas wannabe entrepreneurs haven’t created such experiences. Dan Sullivan has coached more successful entrepreneurs than anyone living on the planet. He currently has over 3,000 people in Strategic Coach paying him between $10,000 and $50,000 annually. In the past 12 months, he developed and opened his “Game-Changers” program, which is $50,000 per year to be a member. According to Dan, he would not have had the confidence to charge that much money had he not previously written a check for $100,000 to be a member of Joe Polish’s 100K Group. When he made that investment in himself, he started to get way more ideas. He had the confidence to do likewise. Obviously, you don’t need to invest $50,000 right now in order to achieve your dreams. But if you begin investing even a little bit into your goals and dreams, you’ll begin to get a 10X return psychologically, relationally, and then financially. You then re-invest in yourself and watch as the confidence and connections increase. As these increase, your ability to succeed changes dramatically. They chose themselves and then created motivation, momentum, inspiration, and confidence. In due process, they designed themselves into the person they wanted to become. If you over-attach yourself to the outcome, you’ll generally be let down. Recently, I launched my first major book and despite the book being successful, I was completely shattered. I expected everything and attached completely to the outcome. 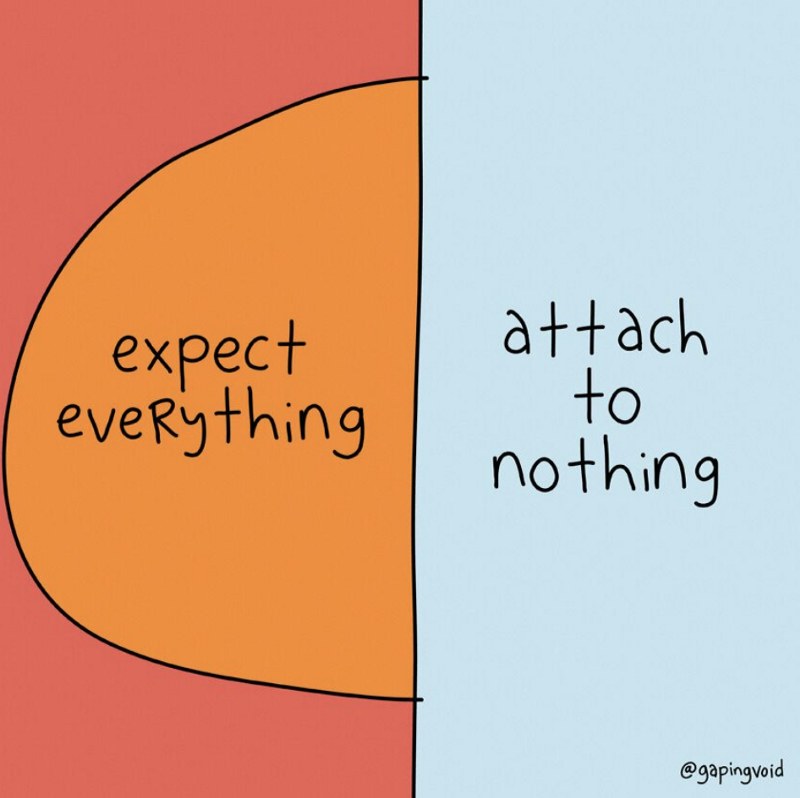 A far better approach is to expect everything and attach to nothing. Lowering your expectations isn’t the answer. According to motivational psychology, expectations both for yourself and from other people are crucial. High standards give you something to stretch for and rise-up to. In an interview with Success Magazine, actor Jeremy Piven explained that as an actor, the only way to work is to go out and audition for specific roles. In the book, Originals: How Non-Conformists Move the World, Adam Grant explains that “originals” (i.e., people who create innovative work) are not reliable. In other words, not everything they produce is extraordinary. And the same is true for you. In order to produce your magnum opus, you’ll need to create a high volume of work. You have to kiss a lot of frogs to find your prince. So I ask: Are you creating a large volume of work? Are you inputting or outputting? If you like building, build more stuff. If you like writing, write more stuff. If you like connecting, connect more. If you like running, run more. Do stuff. Output. Do it more. You give your ideas value by acting on them. A good idea, not acted upon, only brings pain and fear. Conversely, action brings confidence. Action is fun. Inaction slowly kills you inside. Don’t wait to be moved by the spirit. Move the spirit yourself through action. There is no inspiration without action. Action is inspiration. That’s how it works. Faith is action, and thus also power. Faith and fear cannot co-exist in the same person at the same time. Thus, action (i.e., faith) and inaction (i.e., fear) are opposites. Do what you love. Do it more. Output all the time. In 2005, the National Science Foundation published an article showing that the average person has between 12,000 and 60,000 thoughts per day. Of those, 80% are negative and 95% are exactly the same repetitive thoughts as the day before. Recurring thoughts are not a good thing. Most people have recurring thoughts on a daily-basis. Recurring thoughts reflect unfinished projects, unresolved inner conflicts, or needed conversations. If you don’t resolve or complete the loop, then your mind will continue to be occupied and weighted-down by whatever is unresolved. For a long period of time, I had a negative and impulsive relationship with caffeine. I thought about it for years. Hours and hours of time were spent thinking about caffeine. Those hours could have been spent thinking about something else. It wasn’t until I resolved my relationship with caffeine that I was able to FREE MY MIND of that pointlessly recurring thought. Sadly, many people have recurring thoughts for years, sometimes decades. They haven’t resolved the inner conflict or completed the needed project. 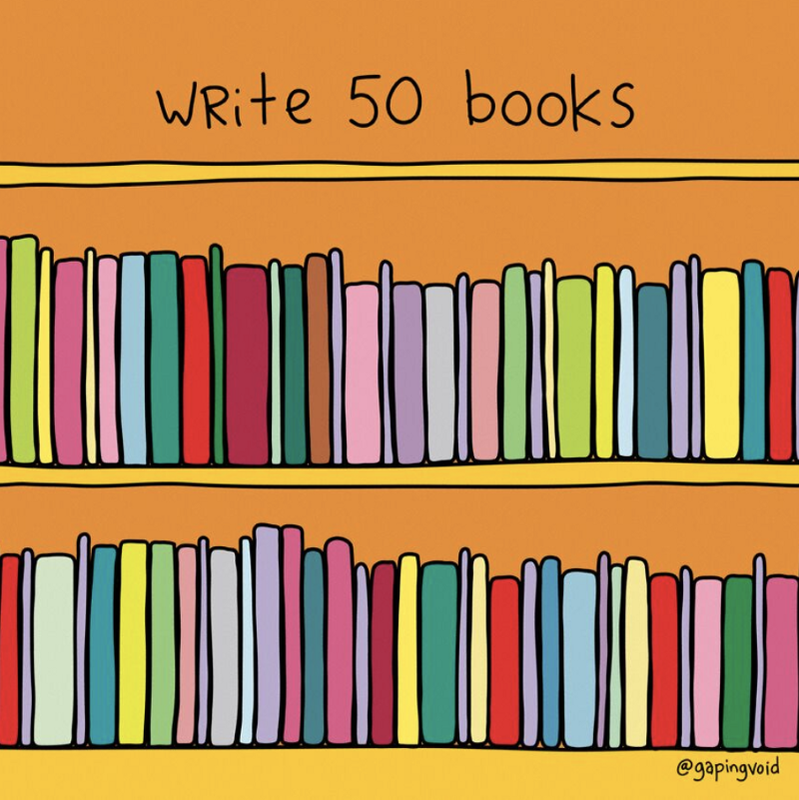 For example, I know lots of people who have wanted to write a book for like 10 years. The idea has been on their mind and they’ve been ruminating about it for a really long time. If they had written the book 10 years ago, they would have opened themselves to so many other thoughts that they never got access to, because their mind was too busy holding onto or thinking about their freaking recurring thoughts. 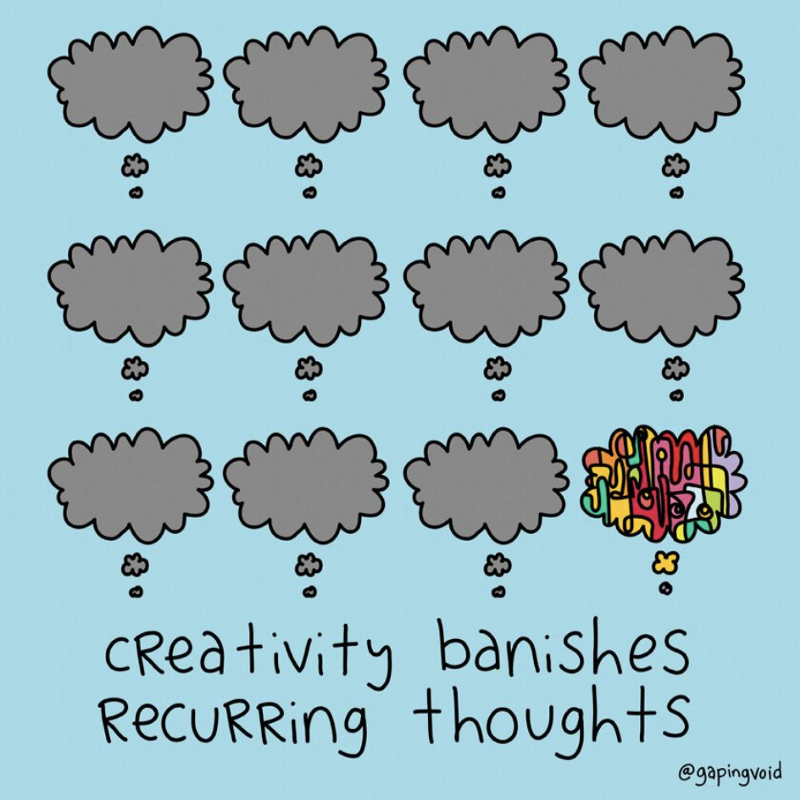 If you have recurring thoughts, BANISH THEM! Resolve them! If you need to, CREATE! Then watch as your mind is given space to think about the next project, and the next, and the next. David Bednar tells the story of a young man had recently purchased a pick-up truck. Needing some firewood, he thought it a great opportunity to test his new truck. He put twigs under the stuck tire in hopes they would provide traction but to no avail. He used a shovel and tried digging around the tire, but he was stuck too deep. Eventually, he became incredibly discouraged. The sun was hastily descending and weather bitterly chilling. He wasn’t sure what to do. He offered a simple prayer and got the impression to start cutting wood. He worked for a few hours, chopping down trees and putting large pieces into the back of his truck. Once the truck was full, he hopped in and turned it on. After a moment of humble silence, he tried reversing out. The heavy load of wood provided the needed traction to get out of the snow, to get back onto the road, and to move forward. Without the load of wood in his truck, he would have remained stuck. Most people mistakenly believe that happiness is the absence of a load. We want life to be easy, without challenge or difficulty. However, it is by having a load that we can have the traction needed to move forward in our lives. When we don’t carry a substantial weight of personal responsibility, we can quickly become stuck. I have found this in my own life. It wasn’t until after I became a foster parent of 3 children — a substantial load indeed — that I was able to get the traction needed to develop my career as a writer. Before having that personal load to carry, I was somewhat complacent. I lacked the urgency. I didn’t have the traction to move forward. A life of ease is not the pathway to growth and happiness. On the contrary, a life of ease is how you get stuck and confused in life. 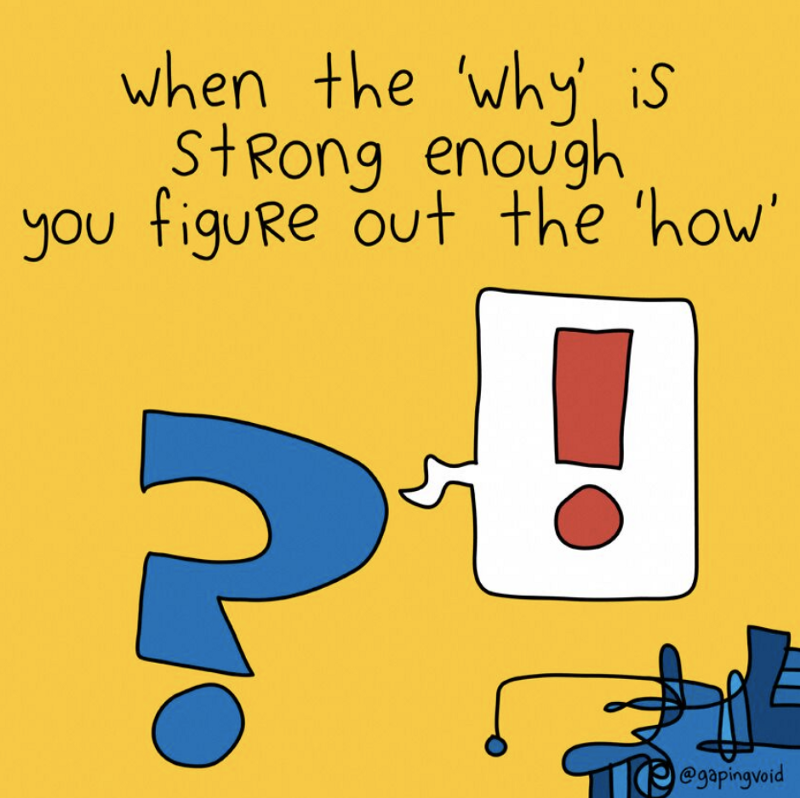 When the why is strong enough, you’ll figure out how. When your why is strong enough, you’ll do whatever it takes. In the book, The Compound Effect, Darren Hardy gives an example of a scenario where you have to risk your life for 20 bucks. Would you do it? Probably not. But would you risk your life in the same scenario if instead of 20 bucks, your child was in danger? Of course you would! If you want more motivation, you generally need a situation that calls upon you to rise above where you currently are. You also need a compelling vision that really really matters to you. The more clear you get on that vision, the more WHY will be behind it. Most Western-thinkers have an atomistic view of the world, assuming that something can be understood regardless of context. For example, who I am as a person is the same from one situation to the next. In contrast to the atomistic worldview is the relational worldview, which assumes something can only be understood within a particular context. From this perspective, I am not the same person from one situation to the next. Depending on the situation and the current role I’m playing, the meaning of who I am can be greatly different. In one situation, I may be a teacher whereas in another situation I may be the student. I could be a father in one situation and a son in another. How I view my wife is completely different from how someone who has never met her before would view her. It is the relationship between me and my wife that makes her who she is, to me. Without the context, she doesn’t have the same meaning. Thus, it is the relationship BETWEEN things that is more fundamental and real than the things themselves. Context is what gives meaning. When you change the context, you change yourself. This is where freedom lies. You aren’t fixed, but incredibly fluid and flexible. You can change and be transformed in incredible ways if you open yourself to new experiences, new situations, and new relationships. What are you working toward that drives you to wake up every single day? What is your 20-25 year plan? According to Dan Sullivan, if you relentlessly pursue something for 20+ years, it will transform everything around you. Your life, your relationships, your environment. Everything will be changed. If you operate from a place of decision, gratitude, and abundance, you will have such an amazing life in 20 years. You’ll have become all that you wanted to be and more. You’ll look back and be shocked by all you did. You need to find something that could fascinate you for 20+ years. How that thing is manifested will obviously change forms. But commitment to a vision, a pursuit, a contribution, is key. What fascinates you enough to build your life around it? What is your greatest contribution to the world? What would bring you incredible joy and passion? What would transform you into the person you want to become? You control your behavior, but principles control the outcomes. The law of the harvest is always in effect. What you plant, you must harvest. Furthermore, what you plant consistently overtime eventually yields a compounded or exponential harvest. Given the choice, which would you rather have: $1,000,000 in your pocket right now or a penny that doubles in value for 31 days? Most people would choose the million. However, the doubling penny actually ends up being $10.7 million dollars. Yet, the majority of the growth happens at the very end, and most people aren’t patient enough for the big return. The live for the moment culture of today stops people from investing. The same holds true of the reverse. Obesity, debt, identity confusion, broken marriages. 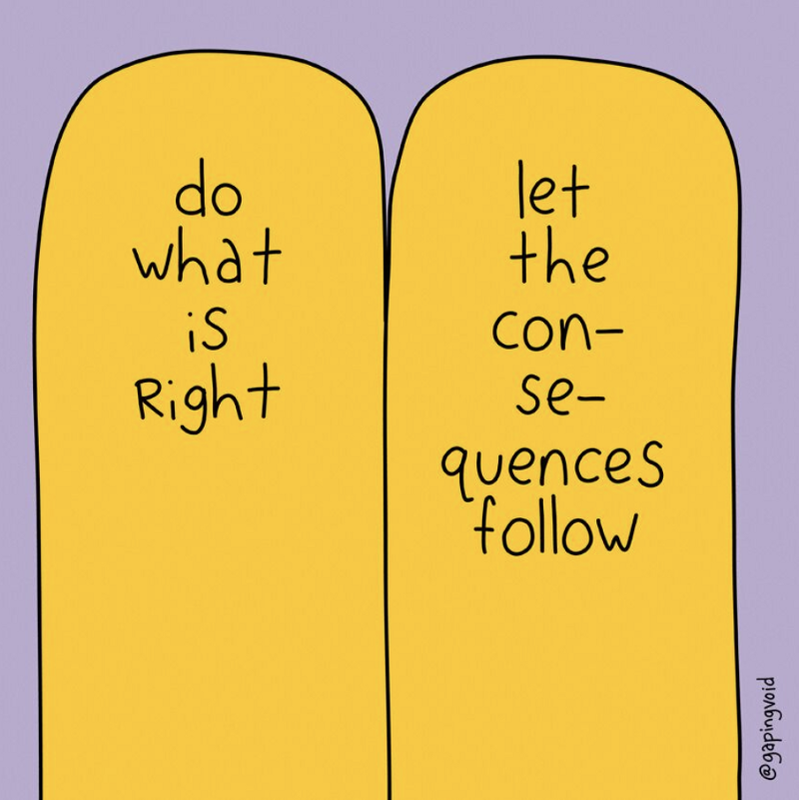 These things are governed by principles, the compounded effect of daily decisions and misguided premises. This final principles ties all of the other 19 together. It brings us right back to where we started. Everything in your life follows your behavior. You choose your behavior and the universe returns in likeness. The more bold and aligned your behavior, the more abundant the outcome.